The Adagio Maiden Grass is an early flowering ornamental grass with red to white plumes that move so gracefully even in the slightest breeze. Adagio Grass is the durable addition for the summer or winter landscape. We've had the opportunity to see this grass first hand at a trip to the Kurt Bluemel Nursery. Kurt Bluemel introduced the Adagio Miscanthus and many other ornamental grasses that you will see on our site. This particular grass was named by Mrs. Bluemel who is an accomplished musician, hence the name Adagio. We recommend planting the Adagio Maiden Grass as a specimen, in large containers, as accent plants, drifts, borders and hedges. The green blades of this grass grows to 4 feet in height with the gorgeous plumbs extending to 5 feet. Plant at least 3 feet apart if planting in groups or in a row. We enjoy the foliage of Adagio Miscanthus Maiden Grass so much that we like to leave it standing until the new growth starts to appear, possibly as late as May. Adagio Maiden Grass is a year-round grass that remains standing even through heavy snowfalls. We also like the combination of the tan foliage with spring flowering bulbs. Cut back to about 6 inches from the crown of the plant when new growth begins to appear. 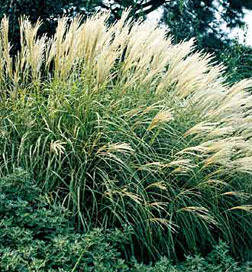 Homeowner Growing & Maintenance Tips: Miscanthus grasses are easy to grow and is a good choice for beginners. It will grow in almost any soil, from loose sand to heavy clay, and does not require good drainage. Grow this grass in full sun except in warmer regions where some afternoon shade is best. Fertilization is not necessary. Divide Miscanthus in spring or early summer to give it time to establish its roots before winter arrives. Only in the mildest of climates should it be divided in the fall. How wide does Adagio Miscanthus Maiden Grass grow?